How to Enroll in Medicare, it’s critically important to understand when you should enroll in Medicare because there are applicable penalties if you miss your deadline. For many people, enrolling in Medicare Part A is automatic. Nonetheless, there are a few instances where you may have to enroll manually in Part A and/or Part B during your Initial Enrollment Period. Call 844-528-8688 for a free no obligation Medicare consultation. Continue reading for details about when and how to sign up for Medicare. Your Initial Enrollment Period (IEP) at age 65 is the seven-month time period that commences three months before you are age 65, which includes the month of your 65th birthday, and concludes three months after that. How to Enroll in Medicare, If you’re receiving any retirement benefits and you are closing in on age 65, your Medicare card will be sent to you approximately 90 days before your 65th birthday. 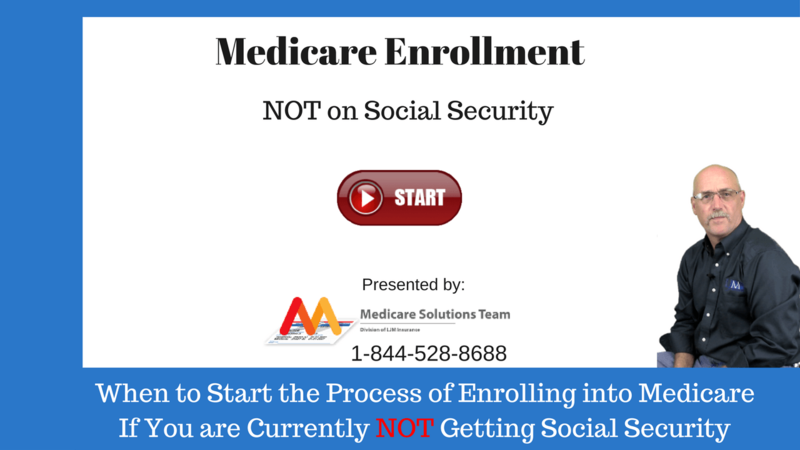 How to Enroll in Medicare, If you don’t qualify for Social Security retirement or Railroad retirement benefits, you will need to manually enroll in Medicare during your IEEP. You might be ineligible for free Part A coverage and if so, the amount of your monthly Part A premium will be based on how long you worked and much Medicare taxes were paid in. Like everyone else, you will be responsible for your Part B premiums. If you failed to enroll during your Initial Enrollment Period (IEP) when you were first eligible to do so, you can still enroll during the General Enrollment Period. Some people choose not to enroll in Part B coverage because they already have health insurance through an employer or union. If they should lose that coverage or simply decide to switch from employer-sponsored health insurance to Original Medicare Part B, they can do so if they are still covered under the group health plan or during Medicare's Special Enrollment Period (SEP). The SEP is an eight-month period that commences either the month your employment ends or when your employer-sponsored group health insurance ends, whichever event happens first. If you are eligible to enroll during the SEP, you will typically not be charged a late penalty. It’s important to note that COBRA benefits and retiree health insurance coverage are not considered employer coverage (group health insurance) and therefore you would not qualify for a SEP. Also, the SEP does not apply if you have End Stage Renal Disease and you are eligible for Medicare. On July 30, 1965, the President of the United States, Lyndon B. Johnson, signed into law new legislation that created and established the Medicare and Medicaid programs for Americans. Medicare Part A is the coverage that takes care of inpatient hospital expenses and skilled nursing facilities. Part A also covers hospice care and certain home health care services but it does not cover expenses for custodial services or long-term care services. Enrollees do not pay a premium for Medicare Part A because they or their spouse has previously paid for it through taxes deducted from their paychecks over their lifetime. Medicare Part B is the coverage that helps pay for medical services provided by doctors while you are an outpatient. Part B will also cover some of the medical services not paid by Part A. These are services like physical and occupational therapy, and some home health care services (must be medically necessary). Your Part B coverage is paid for on a monthly basis and usually changes on an annual basis. Since Part D is a stand-alone coverage and is optional, you must always manually enroll to receive these benefits. Applicants can get prescription drug coverage by either enrolling in a stand-alone Part D plan or by enrolling in a Medicare Advantage Plan that offers Part D coverage. Both Medicare Part D plans and Medicare Advantage Plans are provided by private insurance companies. You cannot, however, have a Part D prescription drug plan and a Medicare Advantage plan the includes prescription drug coverage simultaneously. You qualify for enrolling in Part D drug coverage if you reside in the service area covered by the health plan and you are enrolled in Original Medicare Part A and/or Part B. The IEP for Part D is the same and the IEP for Medicare Part B. As with Medicare Part A and Part B, if you do not enroll for Part D or a Medicare Advantage Plan that has drug coverage when you are first eligible, you will likely be required to pay a late enrollment fee to the private insurance company you select for coverage. Although most married adults generally have had health insurance that covers them both and any children on one insurance plan, Medicare does not offer a plan for married couples. Each eligible adult in the household must purchase their own separate plan. I know all this can be quite confusing, but help is just a phone call away. Give us a call anytime at 844-528-8688, or email us from our contact page, there is never a fee for our services. We work for you not an insurance company. You can also visit or Medicare Publications page.